A Great Family Friendly Vacation awaits you at this newly updated Lakefront 4 bdrm Home! This home is perfect for 2 or more families with 2 levels of living space. Breathtaking views from both levels! The dock was expanded in 2009 which features a covered living area, beautiful dock furniture, larger swim & sun platform, plus 12' X 28' Covered guest boat slip for your use! This Premier Location on 'The Lake' is only Minutes from the Osage Beach Entertainment & Shopping District and all the Best Area Restaurants by Land and/or by Water. Championship Golf Courses, Luxurious Day Spas, Water Park, Go Carts, Para Sailing, Underground Caves, Horseback Riding, Miniature Golf, & State Park are all nearby. Northern end of the lake. Located on the 4.5mm of the Gravois Arm. Main Level offers updated kitchen w/electric appliances and cooking utensils, family room with big screen TV, 2 oversized bedrooms w/ king size beds, full bath, large deck with wrought iron outdoor furniture and incredible lake views. Walk-Out Lower Level offers oversized family/rec room w/ big screen TV, refrigerator & bar area, 3rd oversized bedroom w/ King size bed, 4th bedroom with Queen bed, laundry room, full bath, covered patio and more incredible lake views. We provide gas grill for your cookouts. Outdoor firepit. Private dock for fishing & swimming. 28' Boat slip available for your own boat or rent from local vendors. Covered Parking for 2 cars with space for additional and trailer if needed. All with easy steps down to the water. Bring your Boat, PWC, Wakeboard, Skis, Tubes, Beach Towels, Life Jackets & Fishing Gear and lots of Sun Screen! Fisherman this is the spot! Deep water & crappie beds attract Crappie, Catfish & Bass for some of the lakes best fishing. Fish from 100 ft of natural rock lake frontage or right from the dock. Natural wildlife abounds at this private location. Chipmunks, squirrels, deer and an abundant variety of birds seen regularly all over the property. Three Eagles have already been spotted this year! Heavily wooded second tier lot allows fun times off the water and lots of room to explore. Come see why Families and Fisherman come back again and again to this natural wonderland! Our family have been spending our summers at Lake of the Ozarks for years and love everything thing the lake lifestyle has to offer. The drive from Kansas City is far enough away to feel like an adventure and close enought to make it an easy drive. After an extensive 2 yr search for the perfect property at the best location by land & water, we discovered this wonderful property on the 4 MM of the Gravois Arm. The search was over. There is as much to do off the water, as on! Unbelievable wildlife, go-carts, caves, movie theatres, golfing, Ha Ha Tonka park, seeing the castle ruins is a must! There are several popular restaurants on the water we enjoy very much. We love watching all the different boats go by like powerboats, cruisers, sail boats and fishing boats. We literally spend hours on the new dock every day rain or shine, fishing, swimming and relaxing. Within 5 minute boat ride you can get to popular restaurants/bars such as Coconuts, Mermaid cove at Westport Yacht club, Jolly Rogers, The Jerk Shack and Cabana Jones. 100ft of Lake Frontage With Increadible 3 Mile Views. Upper Level Deck, Walk-out Lower Level Patio! Bring items for Smore's and enjoy the outdoor Fire Pit near waterfront! Second Tier Wooded Lot with Room to Play and Explore. Relax in a Hammock Under a Canopy of Trees Overlooking the Breathtaking Lake Views. This house was perfect for us!! This house was a perfect fit for our family. The four bedrooms all had king or queen sized beds, so none of the couples had to sleep in bunks - bonus! The house was clean and well stocked with towels and kitchen items...plenty of pans, pots, etc, even a good blender for slushy drinks : ) There are two bathrooms and plenty of refrigerator space as there's a full size one upstairs, a full size downstairs, and even a small fridge down on the dock for when you're too lazy to walk back to the house for beverages! And lets talk about that dock - THE BEST! We spent the majority of our family time on the dock. There are lounge chairs and plenty of sunny areas, but also a wonderful shaded area with comfy deck furniture. There's a slip for your boat, and our host was even kind enough to let us use his lift for a couple days when his boat wasn't there. Oh, and the dock has a diving board - that made for some very interesting water entrances! The dock is very large - we even played our bag toss game down there! And there's pretty decent fishing right there - we caught some bluegills, which was fun for our young granddaughter. Kelly and Linda were super nice to deal with, answering all my questions quickly, even the dumb ones like how to use the trash compactor! I would highly recommend this house to anyone looking for a a relaxing time on the lake. Fabulous lake house with amazing dock! We had such a great family vacation here! There was plenty of room for our family of seven to stay in the four bedrooms. It was nice to have both a living room upstairs and a family room downstairs for people to spread out in. We ate dinner outside on the upper deck around the table and drank our morning coffee on the lower deck chairs. Both decks have wonderful views! I won't lie, we spent the majority of time either on the dock or the water. The boys went fishing all the time right off the dock and caught quite a few fish! The diving board and ladder into the water made our swimming time super fun. We tied off our tubes and floated around leisurely all the time. 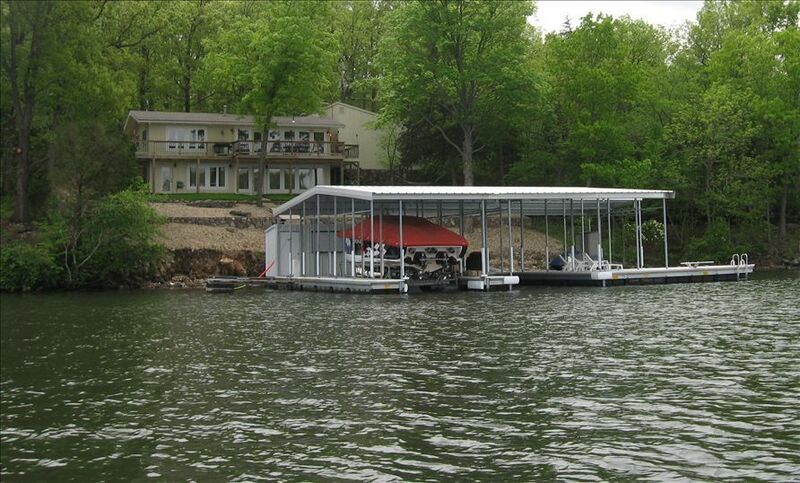 We had rented a large pontoon boat and it fit easily into the extra boat slip. The house is right across the channel from a fun restaurant called Jolly Rogers. We could hear the live music from the deck on Friday and Saturday nights. It was just a two minute boat ride across to it. The location on the lake is perfect because the neighbors aren't too close and you can get to several fun bars/restaurants within a fifteen minute boat ride. We were happy not to be on the main channel because the water in our area never got too choppy. We would for sure come back and stay at this house! My family and I really enjoyed staying here. The location and views were amazing! Great house and perfect location!!! What a wonderful place to stay! The home was perfect for our two family vacation. We had plenty of room and a beautiful view of the lake. Loved the dock and quickly discovered Jolly Rogers which became our favorite place to eat. First time staying so far from Osage Beach but it was totally worth it. Discovered a whole new world on the Gravois Arm and highly recommend it. We will be back!! We had such a great time at the Babb's lakehouse for the 4th of July weekend! There were 11 of us and the house slept everyone comfortably with an extra air mattress--plenty of space for everyone. We really enjoyed the fact that the rooms were large and that there were two living spaces! Our favorite part about the trip though had to have been the dock. It was unfortunately raining most of the weekend, so having a large portion of the dock that was covered still allowed us to be outside the majority of the time. When we were able to catch some sun--the large uncovered portion of the dock was used to the max! We loved everything about it. The house is newly remodeled and was very clean. Had a very cozy feeling. There isn't a spot with a bad view: the living room, deck, fire pit area or dock!!! I can't wait to go back!!! Only Minutes from Osage Beach Entertainment & Shopping District and All the Best Area Restaurants on Land and on the Water. Putt Putt Golf, Water Park, Go Carts, Para Sailing, Numerous Championship Golf Courses All Nearby. **Holiday Rates are $450 per night x 3 plus standard $425/nightly fee + cleaning fee of $200. to equal required length of stay. **Required stay for Holidays area minimum 4 nights. Holidays will not be discounted. Email for Off-Season or Last minute bookings within 14 days of openings and must be paid in Full at time of reservation.